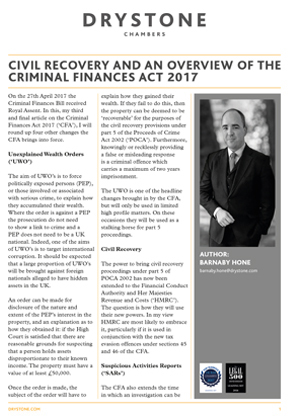 The following article is the third and final article in a series of updates on the Criminal Finances Act 2017 by Barnaby Hone. In this final article, Barnaby rounds up the final four changes the Criminal Finances Act 2017 will bring: Unexplained Wealth Orders, Civil Recovery under part 5 of POCA 2002, Suspicious Activities Reports and Disclosure Orders. Barnaby briefly dissects these topics and offers opinion on which of the changes is more likely to be used, and when.